That look like from the 5 star meal. Love those beautiful colors and flavors! sounds delicious. I love any citrus/cilantro combo and we don't have a lot of access to Cuban food here either. I bet it could make a good dressing as well. This looks delicious....can't wait to try. Next trip to L.A. you must put Versailles on your itinerary. Highly popular Cuban restaurant last time I dined they operated two locations on La Cienega and the original one on Venice Blvd in Culver City. Not fancy, but lines out the door on Sat for authentic, great Cuban cuisine. Oh yum! Looks delish. Great presentation too. I love the freshness from the lemon and coriander. Great marinade, it all looks fantastic! Looks absolutely amazing! I will definitely make this for dinner this week! Thanks for sharing! Look at that! That steak looks great! Steaks are something we normally reserve for warm weather grilling - and let me tell you - its getting hard to not bust out the grill! This steak looks wonderful, Veronica!! I'm always on the lookout for tasty marinades, and this one looks PERFECT!! Can't wait to try it...must get steak when I do the grocery shopping next time. The flavors sound terrific, authentic. This is a classic marinade. We do this a lot with skirt steak or strip steak, and then top it with a chimichurri sauce. I bet that + the rice would be killer! we'll be interested to see if you come up with a good recipe for the rice, because we're searching too. 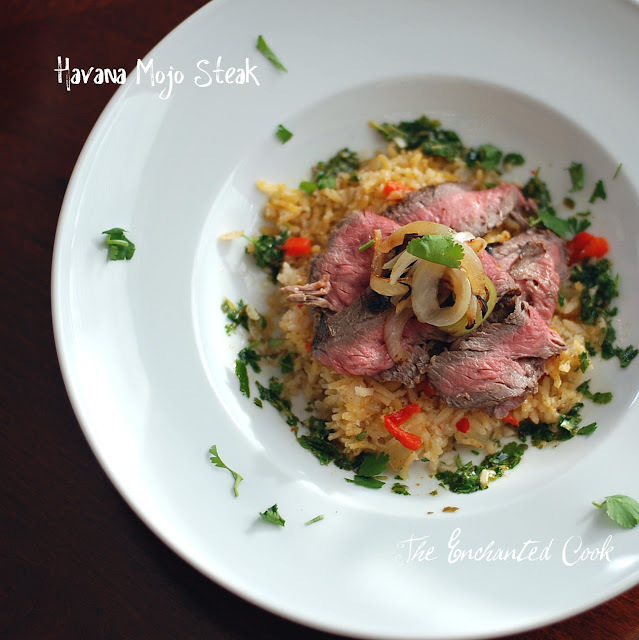 (anyone interested in the chimichurri recipe, feel free to check out our blog!). Sounds yummy. Congrats on your top 9! Wonderful ,delicious Cuban/Spanish/Catalan food. Go to www.cooking.com and check out . Boliche al Caldero Cuban Style/Catalan. Or in Puerto RicanLechon de mechar . Enjoy. I'm so glad I saw this!!! 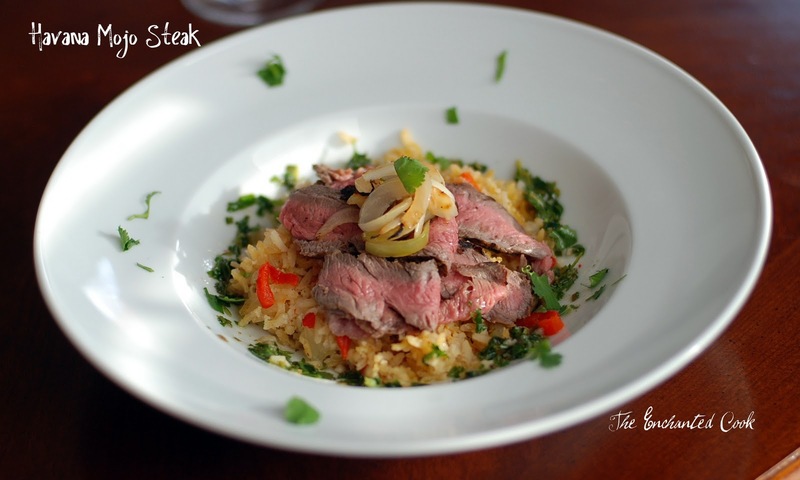 This steak is SO my husband's type of meal, well mine too actually. We love lime, and mix in OJ, herbs and steak and you have a winner. I'm in San Diego and don't know a good Cuban restaurant either... my husband was just talking about one downtown, we will have to check it out. I'll let you know if it's any good! Thanks again for this one, I'm excited!!! I am hosting a fish link up if you want to share any seafood recipes! Hi Veronica, this recipe has summer written all over it. Love the flavors!